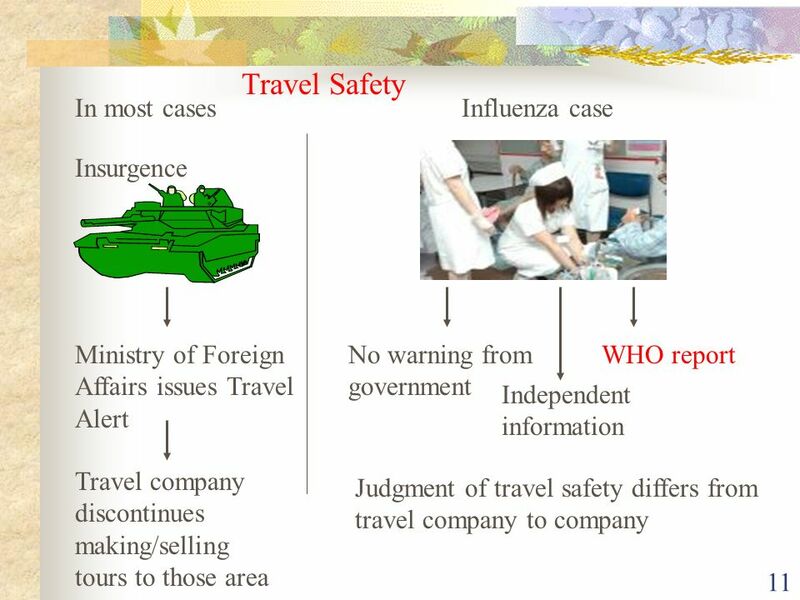 How New Type Influenza affects Travel Contracts in Japan Masaru Sasaki Legal Counsel, International Legal Affairs, JTB Corp.
1 How New Type Influenza affects Travel Contracts in Japan Masaru Sasaki Legal Counsel, International Legal Affairs, JTB Corp.
3 3 Why taking up New Type Influenza First pandemic in nearly 80 years SARS was a regional epidemic not pandemic Unpredictable! Huge GNP loss of nearly US$2,200bn to the world tourism economy (WHO estimates) Valuable lessons for travel industry !! 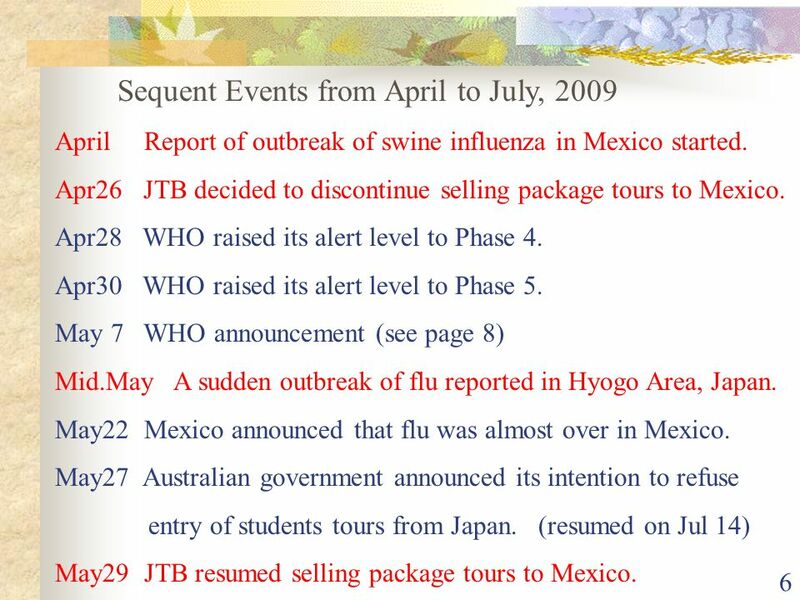 6 6 Sequent Events from April to July, 2009 April Report of outbreak of swine influenza in Mexico started. Apr26 JTB decided to discontinue selling package tours to Mexico. Apr28 WHO raised its alert level to Phase 4. Apr30 WHO raised its alert level to Phase 5. 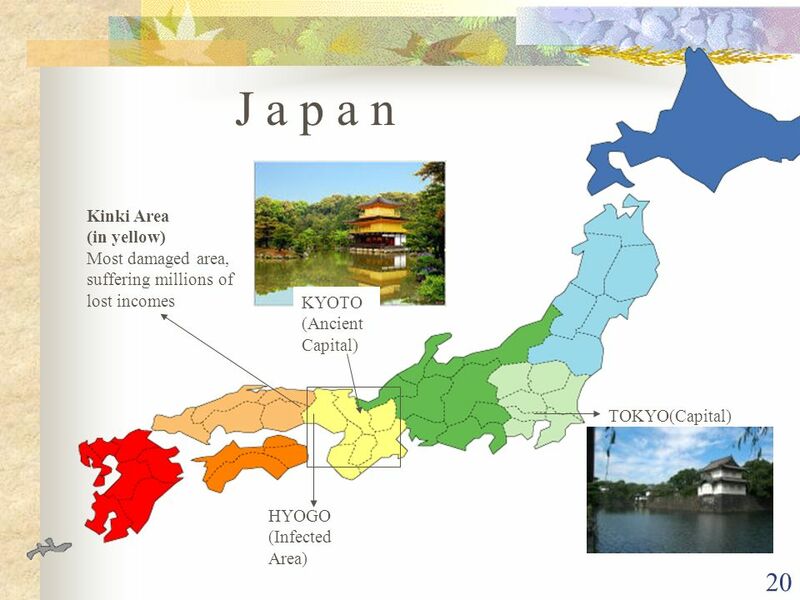 May 7 WHO announcement (see page 8) Mid.May A sudden outbreak of flu reported in Hyogo Area, Japan. May22 Mexico announced that flu was almost over in Mexico. May27 Australian government announced its intention to refuse entry of students tours from Japan. (resumed on Jul 14) May29 JTB resumed selling package tours to Mexico. 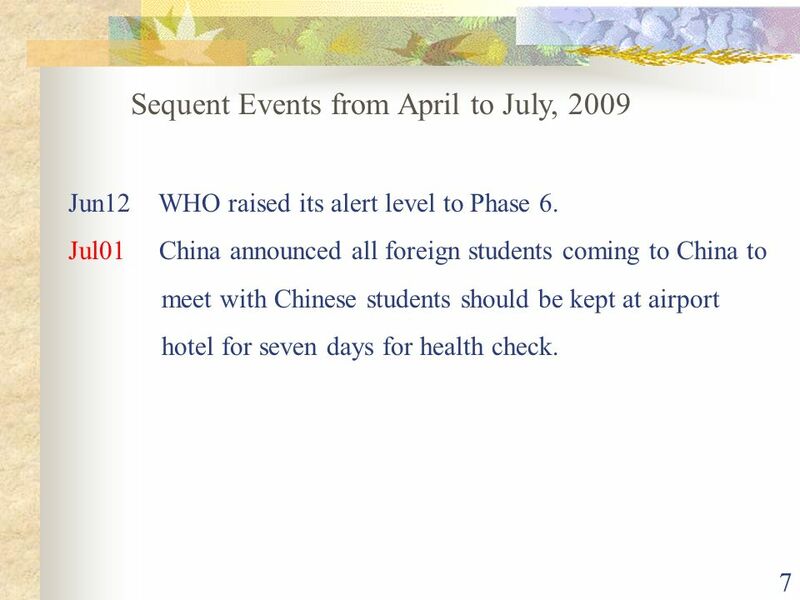 7 7 Sequent Events from April to July, 2009 Jun12 WHO raised its alert level to Phase 6. Jul01 China announced all foreign students coming to China to meet with Chinese students should be kept at airport hotel for seven days for health check. 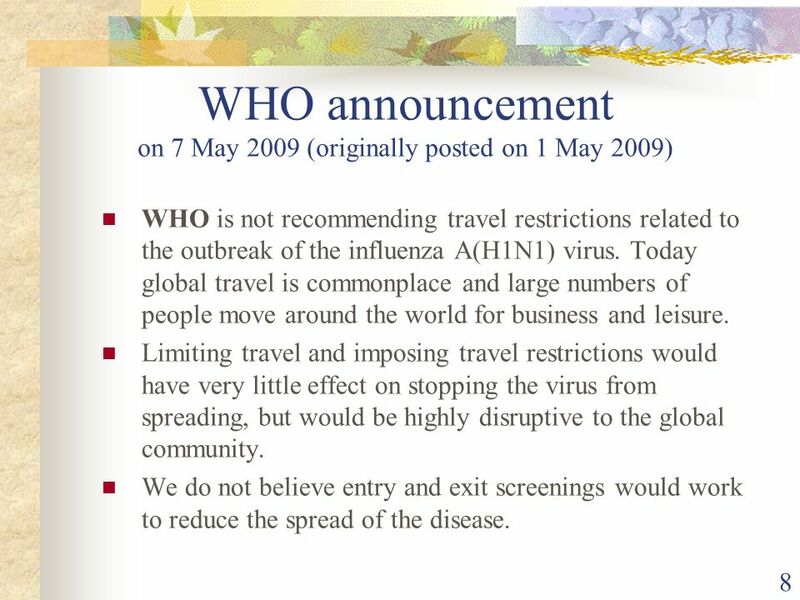 8 8 WHO announcement on 7 May 2009 (originally posted on 1 May 2009) WHO is not recommending travel restrictions related to the outbreak of the influenza A(H1N1) virus. Today global travel is commonplace and large numbers of people move around the world for business and leisure. Limiting travel and imposing travel restrictions would have very little effect on stopping the virus from spreading, but would be highly disruptive to the global community. We do not believe entry and exit screenings would work to reduce the spread of the disease. 12 12 How is Terms and Conditions regulated in Japan? 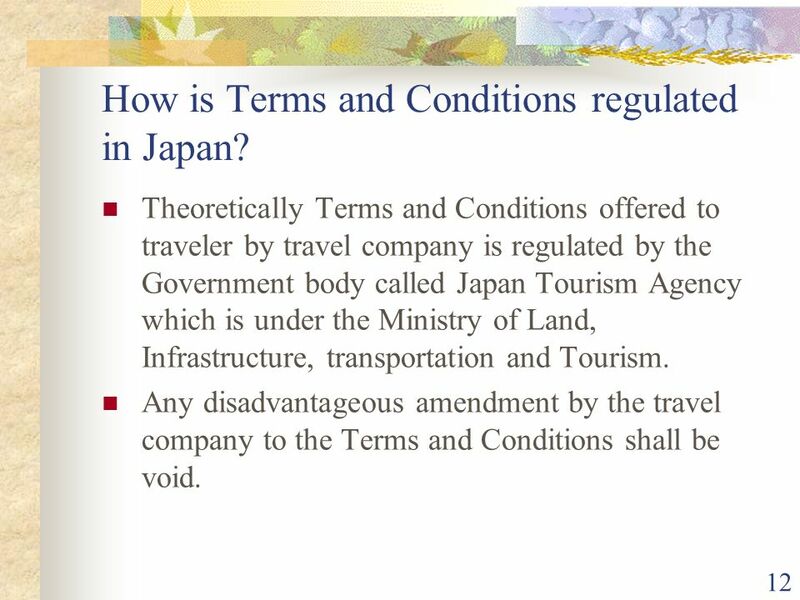 Theoretically Terms and Conditions offered to traveler by travel company is regulated by the Government body called Japan Tourism Agency which is under the Ministry of Land, Infrastructure, transportation and Tourism. 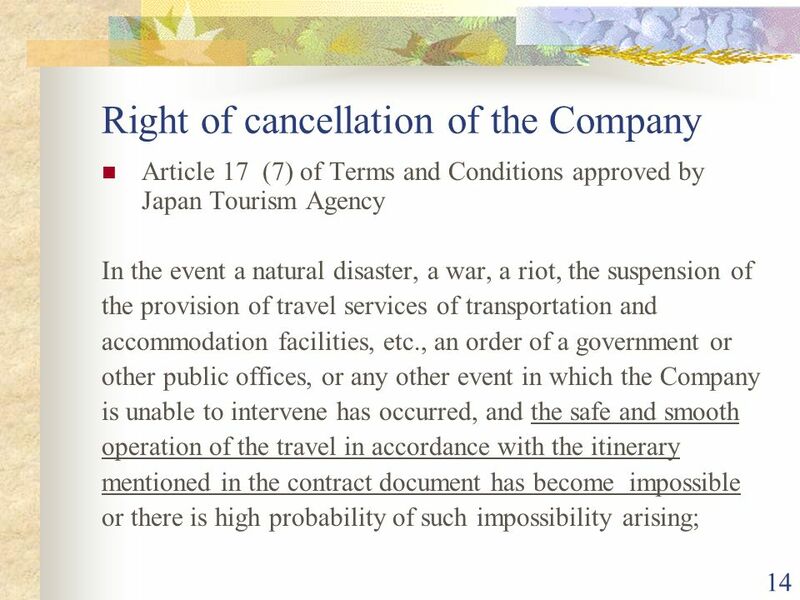 Any disadvantageous amendment by the travel company to the Terms and Conditions shall be void. 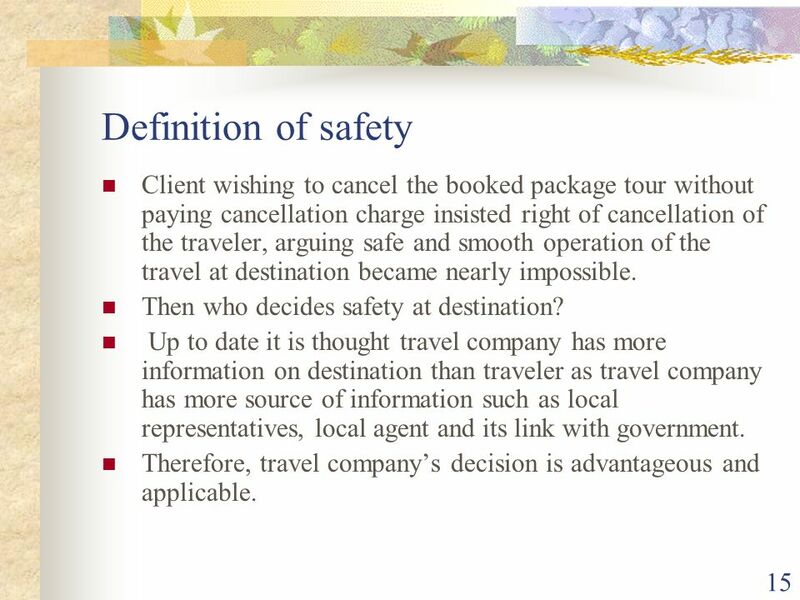 15 15 Definition of safety Client wishing to cancel the booked package tour without paying cancellation charge insisted right of cancellation of the traveler, arguing safe and smooth operation of the travel at destination became nearly impossible. Then who decides safety at destination? Up to date it is thought travel company has more information on destination than traveler as travel company has more source of information such as local representatives, local agent and its link with government. 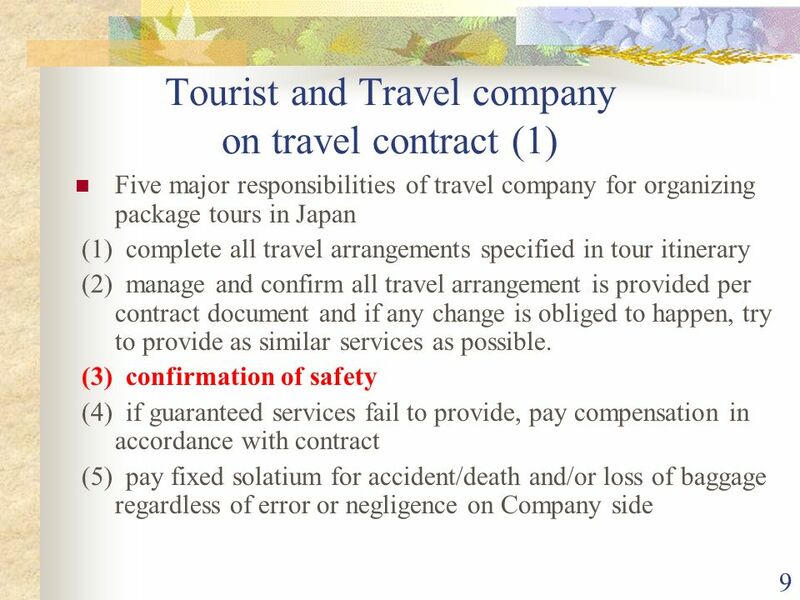 Therefore, travel companys decision is advantageous and applicable. 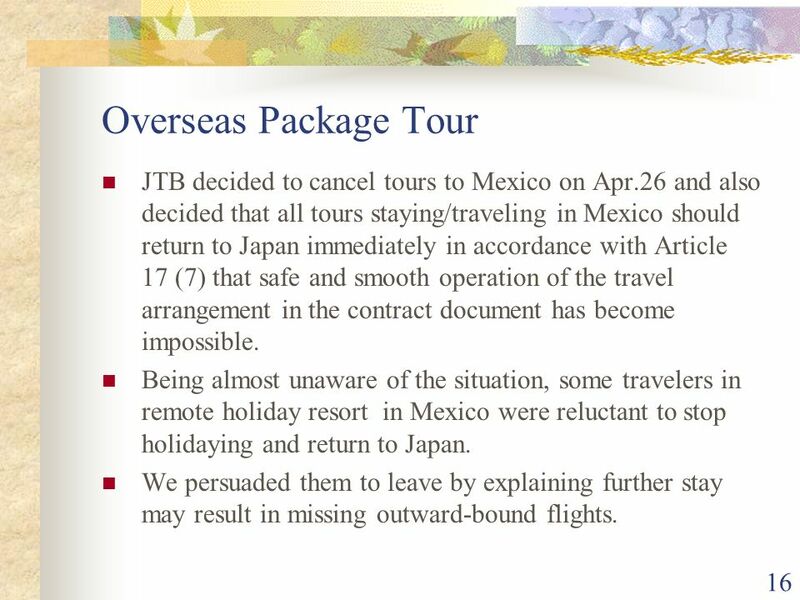 16 16 Overseas Package Tour JTB decided to cancel tours to Mexico on Apr.26 and also decided that all tours staying/traveling in Mexico should return to Japan immediately in accordance with Article 17 (7) that safe and smooth operation of the travel arrangement in the contract document has become impossible. Being almost unaware of the situation, some travelers in remote holiday resort in Mexico were reluctant to stop holidaying and return to Japan. We persuaded them to leave by explaining further stay may result in missing outward-bound flights. 17 17 Overseas Package Tour (2) THEN how about organizing package tours to other parts of the world and resuming tour to Mexico? Is it a safe destination? 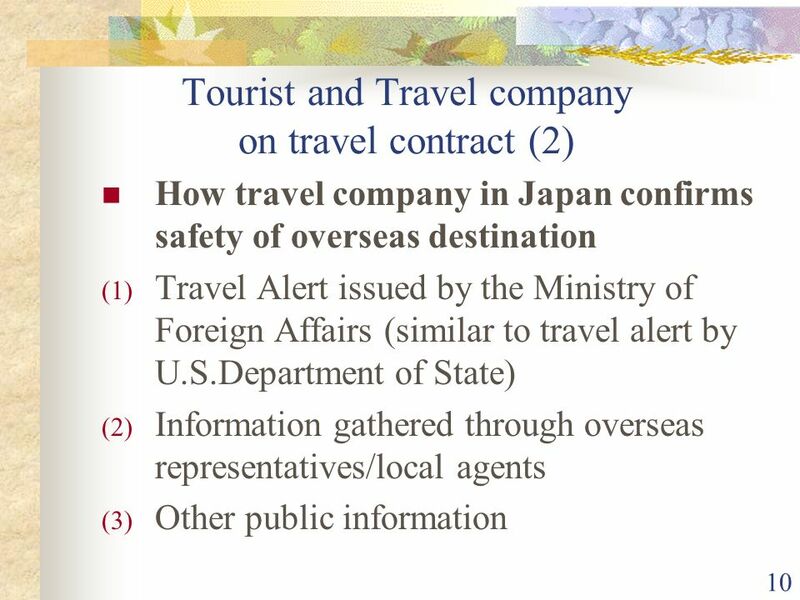 We gathered information from various sources and tried to confirm/verify the safe and smooth operation of the tours. 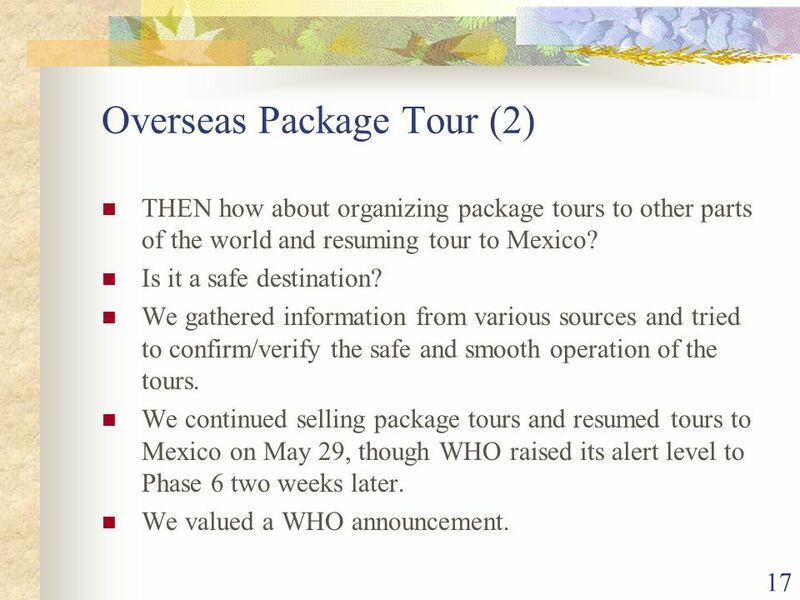 We continued selling package tours and resumed tours to Mexico on May 29, though WHO raised its alert level to Phase 6 two weeks later. We valued a WHO announcement. 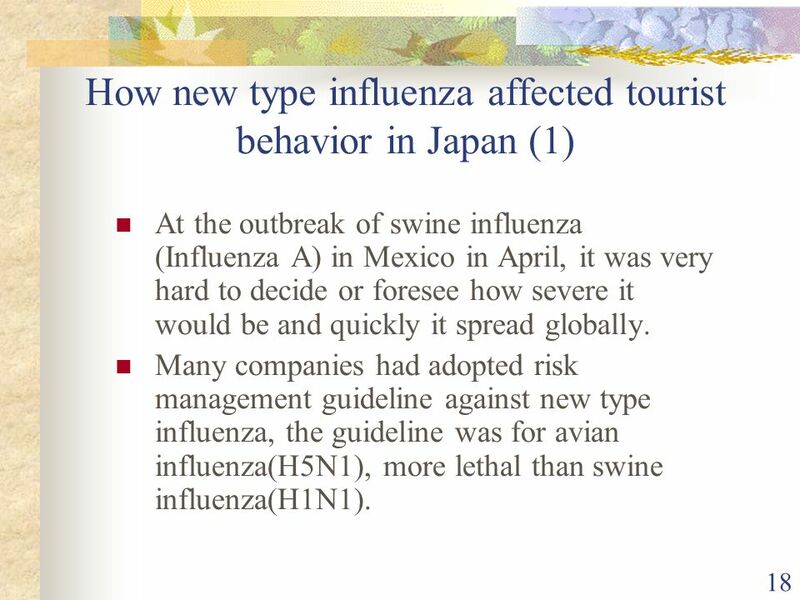 18 18 How new type influenza affected tourist behavior in Japan (1) At the outbreak of swine influenza (Influenza A) in Mexico in April, it was very hard to decide or foresee how severe it would be and quickly it spread globally. 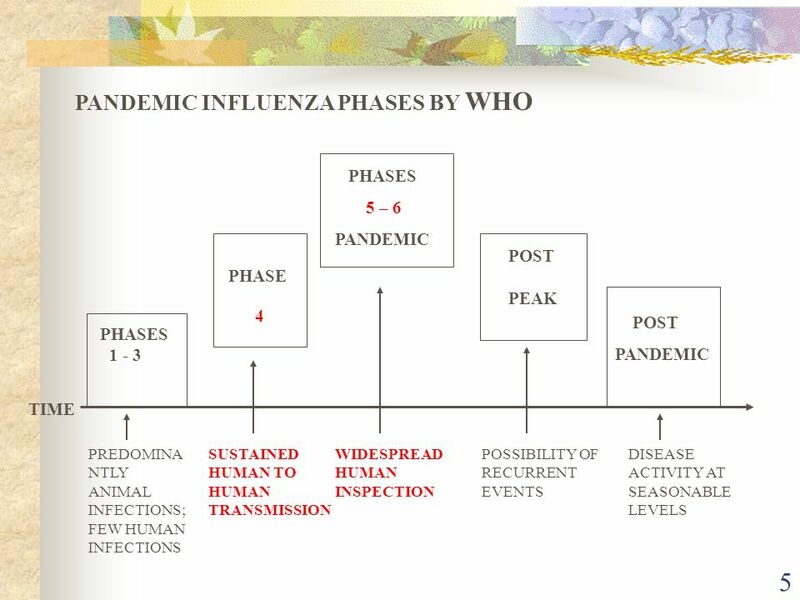 Many companies had adopted risk management guideline against new type influenza, the guideline was for avian influenza(H5N1), more lethal than swine influenza(H1N1). 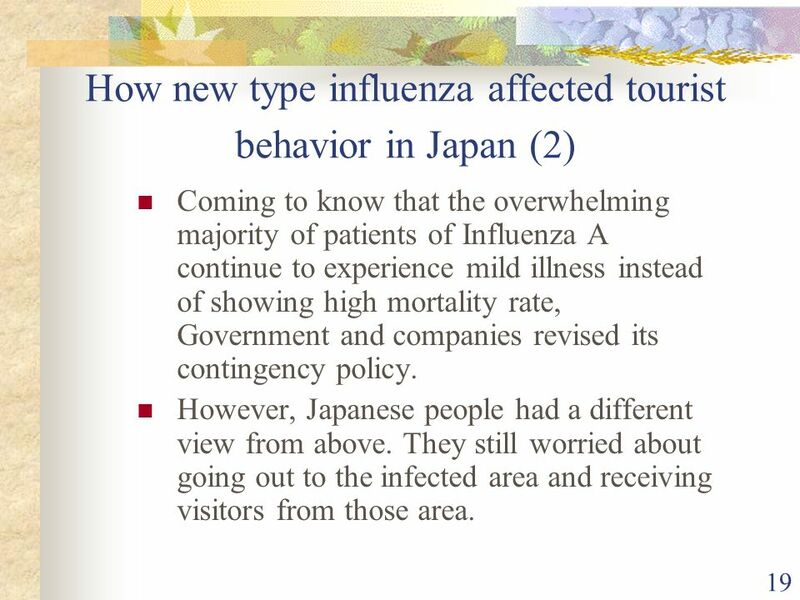 19 19 How new type influenza affected tourist behavior in Japan (2) Coming to know that the overwhelming majority of patients of Influenza A continue to experience mild illness instead of showing high mortality rate, Government and companies revised its contingency policy. However, Japanese people had a different view from above. They still worried about going out to the infected area and receiving visitors from those area. 21 21 Troubled figures in Kinki Area for one month after the first patient was reported in Kinki Area Number of cancellation at hotels 360,000 Lost income 45 million (US$) Temporary total closure of primary/high school An emergent local government subsidiary was proposed and approved! 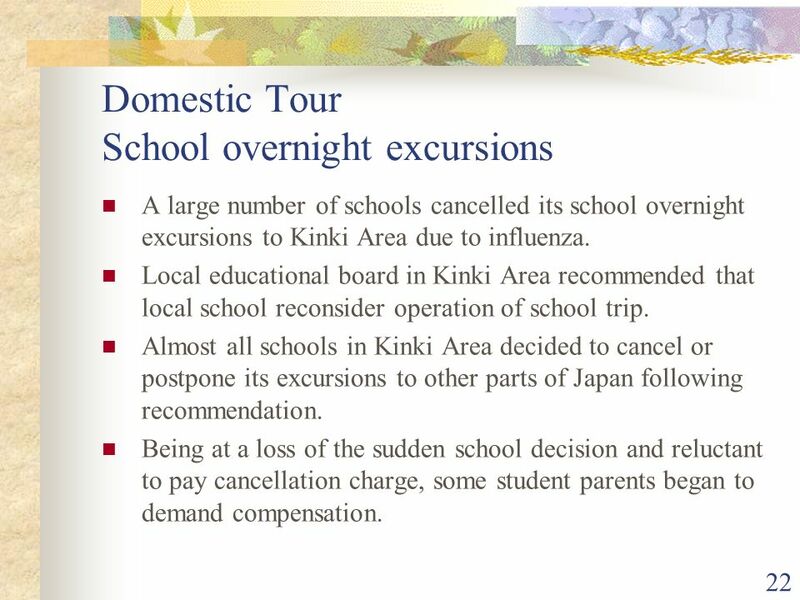 22 22 Domestic Tour School overnight excursions A large number of schools cancelled its school overnight excursions to Kinki Area due to influenza. Local educational board in Kinki Area recommended that local school reconsider operation of school trip. Almost all schools in Kinki Area decided to cancel or postpone its excursions to other parts of Japan following recommendation. Being at a loss of the sudden school decision and reluctant to pay cancellation charge, some student parents began to demand compensation. 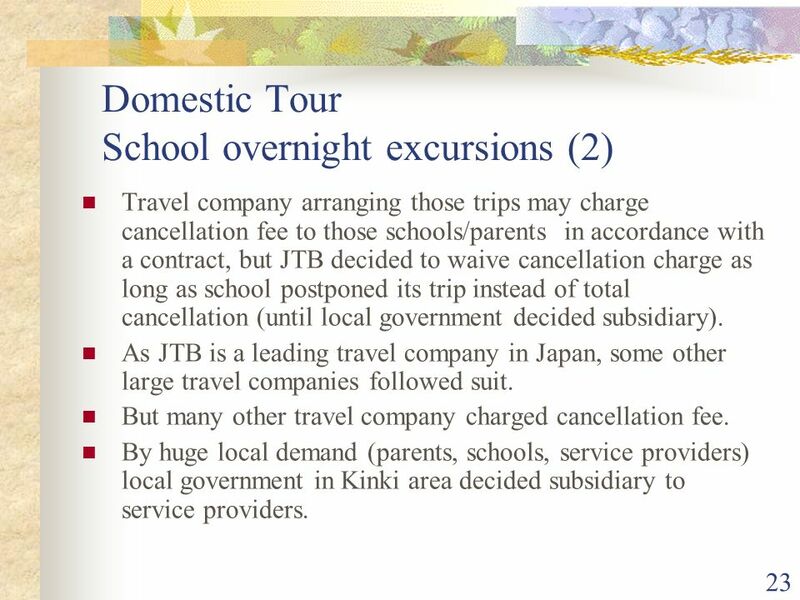 23 23 Domestic Tour School overnight excursions (2) Travel company arranging those trips may charge cancellation fee to those schools/parents in accordance with a contract, but JTB decided to waive cancellation charge as long as school postponed its trip instead of total cancellation (until local government decided subsidiary). 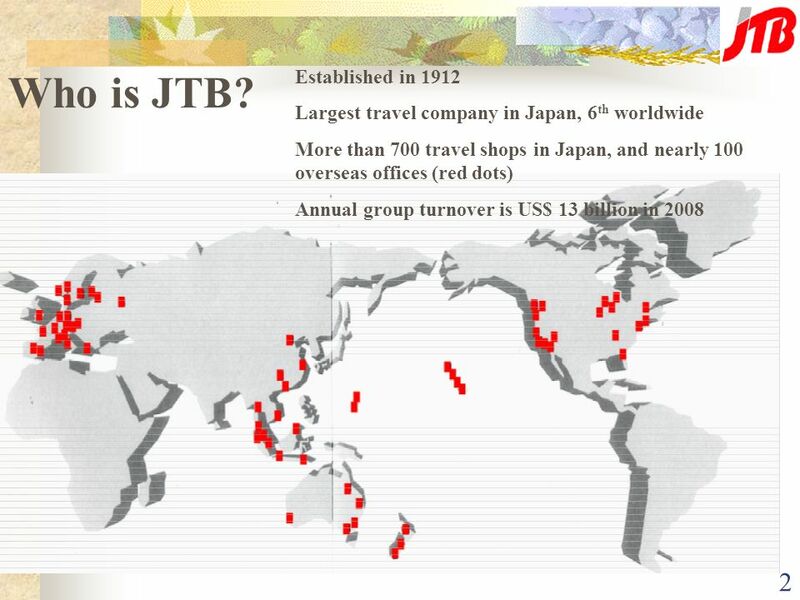 As JTB is a leading travel company in Japan, some other large travel companies followed suit. 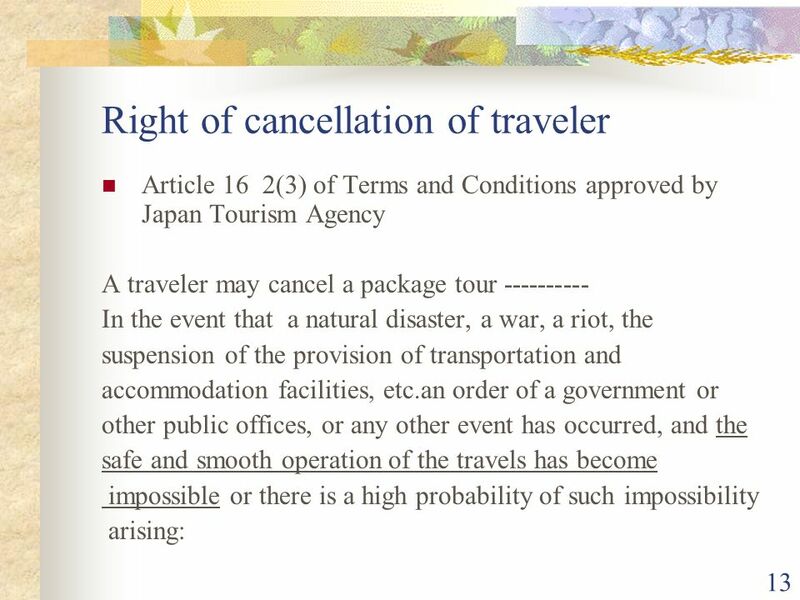 But many other travel company charged cancellation fee. By huge local demand (parents, schools, service providers) local government in Kinki area decided subsidiary to service providers. 24 24 School overnight excursions abroad School overnight excursions abroad is also popular among private schools in Japan. Popular destinations are Australia, Korea, Taiwan, and China. 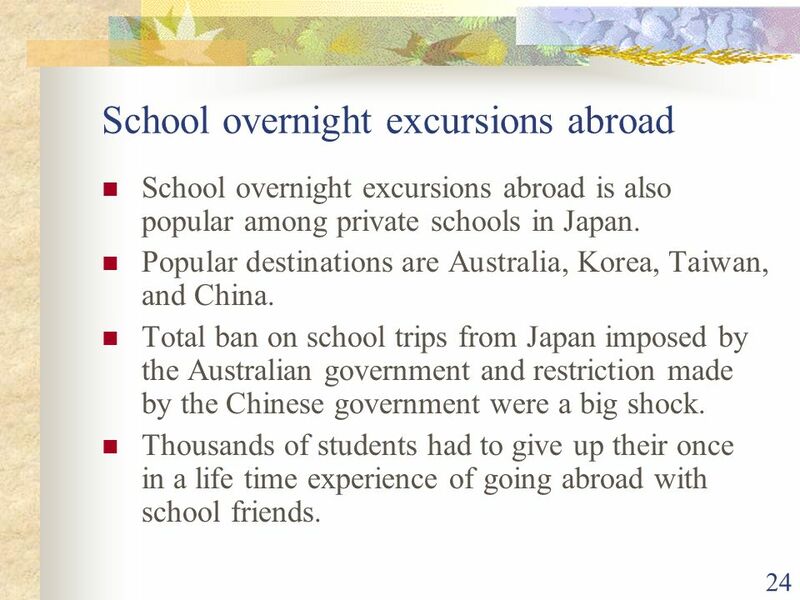 Total ban on school trips from Japan imposed by the Australian government and restriction made by the Chinese government were a big shock. Thousands of students had to give up their once in a life time experience of going abroad with school friends. 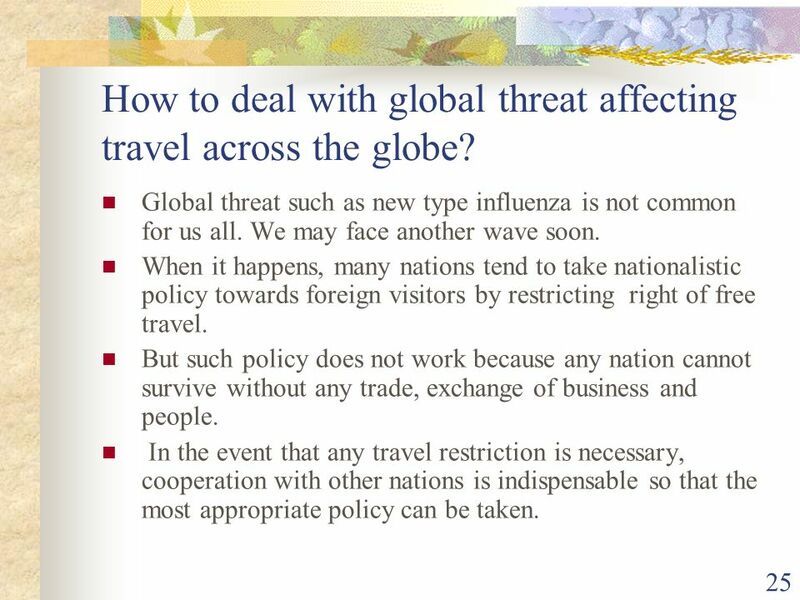 25 25 How to deal with global threat affecting travel across the globe? 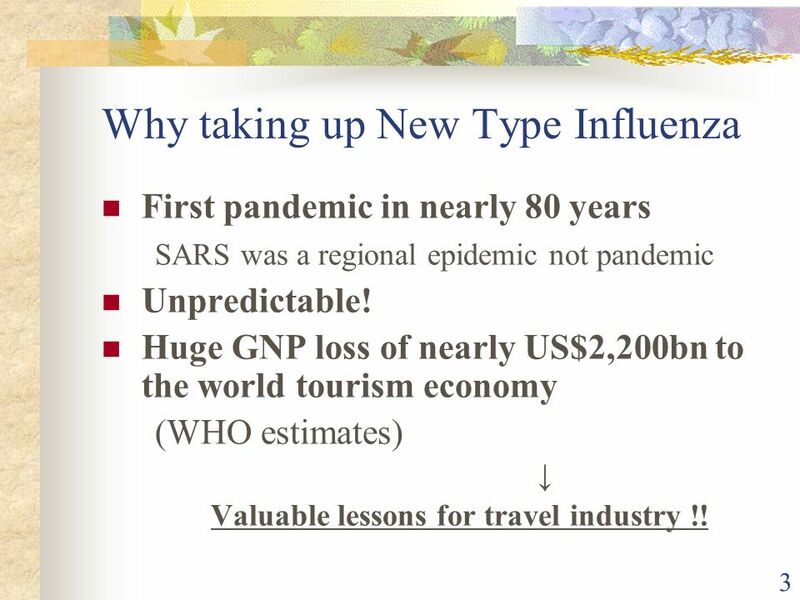 Global threat such as new type influenza is not common for us all. We may face another wave soon. When it happens, many nations tend to take nationalistic policy towards foreign visitors by restricting right of free travel. But such policy does not work because any nation cannot survive without any trade, exchange of business and people. In the event that any travel restriction is necessary, cooperation with other nations is indispensable so that the most appropriate policy can be taken. 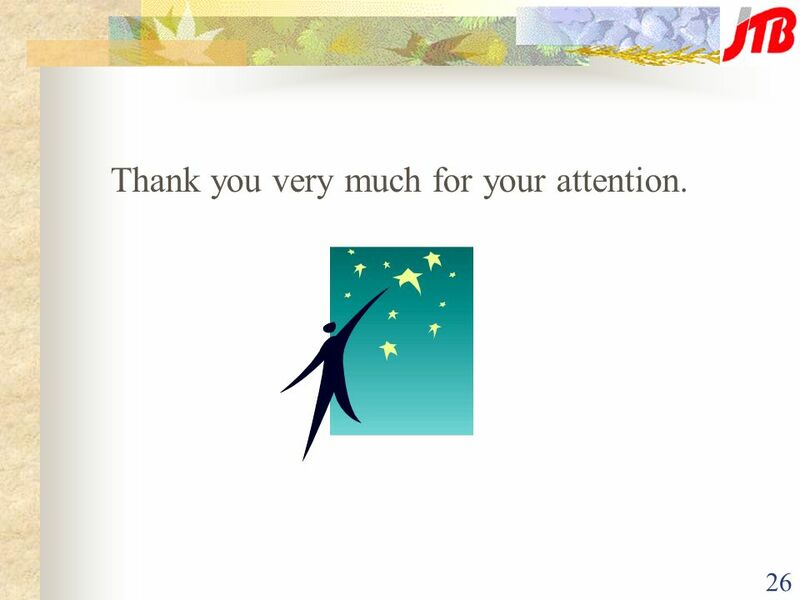 26 26 Thank you very much for your attention. 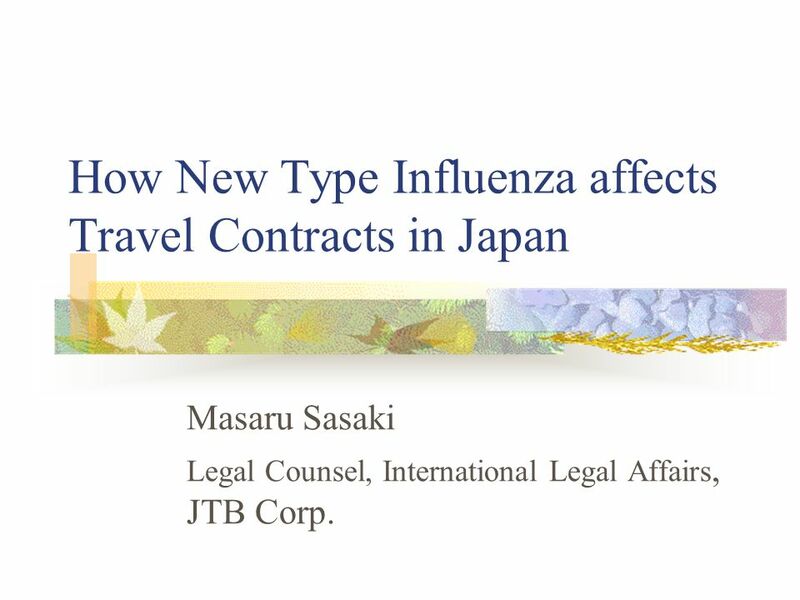 Download ppt "How New Type Influenza affects Travel Contracts in Japan Masaru Sasaki Legal Counsel, International Legal Affairs, JTB Corp."
Why should we teach Critical Literacy? A Life Lesson. Copyright © 2008 Pearson Addison-Wesley. All rights reserved. Chapter 14 Money in the Open Economy. Impact of the Global Financial Crisis on Tourism Destinations & Mitigation Efforts Mekhak Apresyan & Alan Saffery Ministry of Economy / CAPS. H1N1. Family Physician Medical Director & Founder, NE Calgary Womens Clinic Medical Director, Mosaic Primary Care Network NOT an H1N1 official or expert.